The 2015 Nissan Frontier has so many options and trims available, there is no doubt that you will find a Nissan Frontier perfect for your lifestyle. The Frontier is the mid-size truck with full-size power! Take a drive in one of these powerful trucks so you can experience its amazing towing capabilities and off-road potential. Go exploring in a 2015 Nissan Frontier from Carriage Nissan! The 2015 Nissan Frontier is available in two body styles, each with 5 available trims: King Cab—2015 Nissan Frontier S King Cab®, SV 4-Cylinder King Cab®, SV V6 King Cab®, Desert Runner® King Cab®, and Pro-4X® King Cab®; or Crew Cab—2015 Nissan Frontier S Crew Cab, SV V6 Crew Cab, Desert Runner® Crew Cab, Pro-4X® Crew Cab, and SL Crew Cab. Depending on which 2015 Nissan Frontier you like, you will have the choice between a 2.5-liter DOHC 16-valve 4-cylinder engine generating 152 horsepower and 171 lb-ft of torque, or a 4.0-liter DOHC 24-valve V6 engine generating 261 horsepower and 281 lb-ft of torque. The efficient 2.5-liter engine comes in the following trim levels: 2015 Nissan Frontier S King Cab®/Crew Cab and the SV 4-Cylinder King Cab®. You can get the more powerful 4.0-liter engine in these following trims: 2015 Nissan Frontier S Crew Cab, SV V6 King Cab®/Crew Cab, Desert Runner® King Cab®/Crew Cab, Pro-4X® King Cab®/Crew Cab, and the SL Crew Cab. The 2.5-liter engine can achieve 23 mpg highway and 17 mpg city*, while the 4.0-liter engine 22 mpg highway and 16 mpg city*. There is a truck fit for every lifestyle! The Nissan Frontier is one of the most iconic trucks on the market. Standard exterior features on the King Cab® include: 15-inch 6-spoke wheels, chrome grille, upper body/lower black front bumper and chrome rear bumper, black door handles and mirrors, locking tailgate and cargo bed light, tailgate spoiler, front UV-reducing solar glass, and rear privacy glass. On the Crew Cab you can find impressive standard features including: 16-inch 6-spoke steel wheels, front tow hooks (4×4 only), chrome grille, upper-body color/lower black front bumper and chrome rear bumper, black door handles and mirrors, locking tailgate and cargo bed light, tailgate spoiler, front UV-reducing solar glass, rear privacy glass, and a rear window defroster. Available features on higher trim levels can include: dual power outside mirrors, Ulti-track® Channel System with four tie down cleats, a Rear Sonar System, and/or step rails. Take a look at all of the trims to find out which features are your favorite! The Nissan Frontier’s interior is built for comfort and convenience. The interior space is equivalent to that of a regular sedan. Don’t sacrifice space for you and your passengers for more cargo room! Get the best of both worlds in the 2015 Nissan Frontier–a spacious cabin and a large truck bed together! Standard interior features on the King Cab® include: Second-row under-seat storage, cloth seat trim, and a standard audio system with 4 speakers. On the Crew Cab you can find impressive standard features including: Bluetooth® hands-free phone system, air conditioning, cruise control, second-row under seat storage, cloth seat trim, AM/FM/CD audio system with 6 speakers, illuminated steering wheel-mounted audio controls, and MP3/WMA CD playback capability. Available features on higher trim levels can include: power door locks and windows with driver’s one-touch auto-down, remote keyless entry, cruise control, a RearView Monitor, NissanConnect? with Mobile Apps and Navigation, a 5-inch color display, USB connection port for iPod® interface and other compatible devices, SiriusXM Satellite Radio with 3-month trial subscription, streaming audio via Bluetooth® wireless technology, and more! Whether you just want a truck with the basic features for work, or if you want it all, there is a Frontier made for you! The 2015 Nissan Frontier was built to keep you safe. The premium standard safety features include: Nissan Advanced Airbag System (AABS) with dual-stage supplemental front air bags with seat belt and occupant classification sensors, Driver and front-passenger seat-mounted side-impact supplemental air bags, Roof-mounted curtain side-impact supplemental air bags with rollover sensor for outboard occupant head protection, Vehicle Dynamic Control (VDC) with Traction Control System (TCS), Active Brake Limited Slip (ABLS), Front-seat Active Head Restraints, Zone Body construction with front and rear crumple zones, Hood buckling creases, energy absorbing steering column, and pip-style steel side-door guard beams, Pipe-style steel side-door guard beams, Tire Pressure Monitoring System (TPMS), and LATCH System. 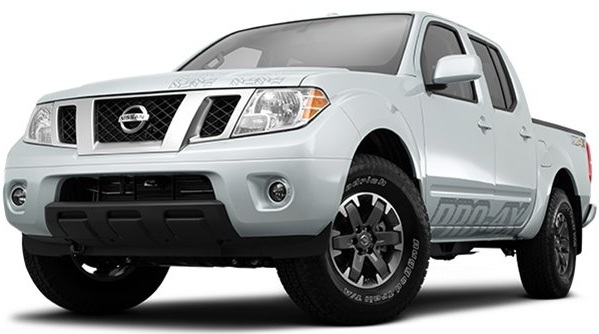 Be sure to stop into Carriage Nissan and take the 2015 Nissan Frontier for a test drive today! With our large inventory, our team here at Carriage Nissan loves helping our customers find the perfect new car or used car for them! Please feel free to contact us if you have any questions or would like to schedule a test drive!